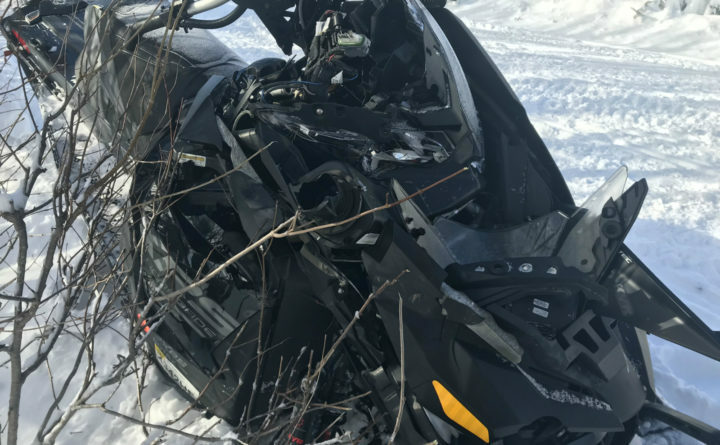 Juan Fernandez was riding this 2015 Ski Doo snowmobile when he collided with a moose Friday evening on a trail west of Greenville. The impact severely damaged the sled and killed the moose, according to game wardens. A Maine snowmobiler drove his sled eight miles Friday night with a fractured leg after he was involved in a chain reaction snowmobile accident started by a moose, game wardens said. Bruce Saucier, 44, was the last sled of three riding around 6 p.m. Friday on ITS 110 when the lead rider — Alex Giebitz, 27, from East Berne, New York — saw the young moose in a trail west of Greenville, according to information released late Saturday by John MacDonald, spokesman for the Maine Department of Inland Fisheries and Wildlife. Giebitz was able to avoid the moose, MacDonald said, but Juan Fernandez, 33, from Almond, New York, who was riding a 2015 SkiDoo Renegade was unable to avoid the animal and collided with it. The impact killed the animal and caused considerable damage to Fernandez’s sled. In his attempt to avoid the moose, Saucier collided with the rear end of Fernandez’s sled and the impact fractured Saucier’s right leg. Saucier was able to drive his 2018 Yamaha Sidewinder back to their camp in Elliotsville, where he was moved to a private vehicle and taken to Eastern Maine Medical Center in Bangor, MacDonald said. According to investigating Warden Kevin Pelkey, all three men were wearing helmets. The trio were issued a permit to keep the moose.